Whether sent as a gift or for yourself, all products available can be personalised and customised, so if ever you see something and want it tailoring, the castle will happily do that for you. Cards, bookmarks, fridge magnets, wall hangings, door hangers, blessing bags, christening and wedding keepsakes, the day you were born / married keepsakes, letters from the tooth fairy and santa, bunting, baby collages, car window signs, wine bottle labels and much more! Not to mention the fab Felt Family and lots of lovely hair accessories! To ensure you get exactly what you want to the best possible standard, I pride myself on the time and care I spend on each product. 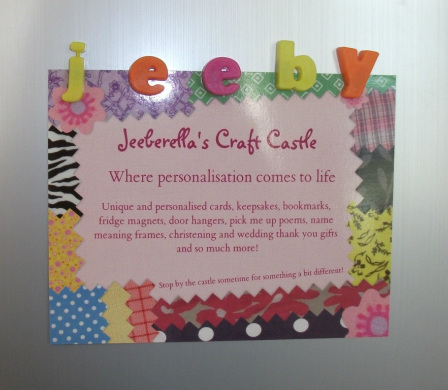 My mission for the business is to have people love my crafty creations as much as I enjoy making them!